Midnyte Reader: Sword at Sunset. Title/Author: Sword at Sunset by Rosemary Sutcliff. Publisher: Chicago Review Press, 1963. Synopsis: This brilliant reconception of the Arthurian epic cuts through the familiar myths and tells the story of the real King Arthur: Artos the Bear, the mighty warrior-king who saved the last lights of Western civilization when the barbarian darkness descended in the fifth century. Artos here comes alive: bold and forceful in battle, warm and generous in friendship, tough in politics, shrewd in the strategy of war - and tender and tragically tormented in love. Out of the braiding of ancient legend, fresh research, soaring imagination and hypnotic narrative skill comes a novel that has richly earned its reputation as a classic. ~Goodreads.com. Midnyte Musings: Oh how I've missed the world of Dark Ages and Medieval Britain in literature. 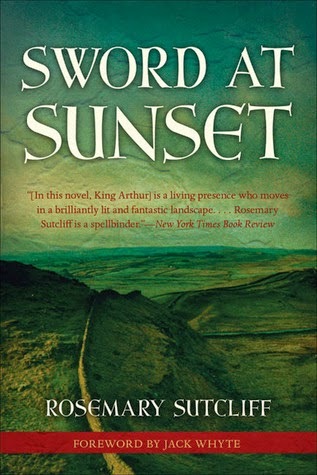 I used to read a lot of re-tellings about the legend of King Arthur and I had heard of Sword at Sunset but had never gotten to it. I wanted to note the year of original publication above, because this book stands the test of time and reads beautifully today even though the language immediately immersed me in the world of King Arthur's Britain. Although I am no scholar on Medieval Times, Sutcliff either did her research or utilizes expressions and language that serve the time period. Much of the language is mixed in so you can interpret it via context. Also well researched is the landscape, history, culture and warfare. This is not a story featuring Kings and Queens in golden palaces and tournaments for honor, but a gritty and dark story of Artos, who is a soldier and inherits his uncle's dream of a unified Britain. However, mixed in with the history lesson and fighting is a Britain that mixes Roman history, Welsh Mythology and Celtic culture into a haunting landscape of a beautiful tale of long ago. At the heart of this story is our hero "Artos the Bear," who meets his nemesis early on in the story, his half-sister who is his undoing. In this incarnation she is called Ygerna instead of Morgana or Morgan. Later on in the story we meet Medraut (Mordred), who takes up the mantle of his mother's vendetta. However, the main meat of the story is Artos's campaign to keep the raiding Saxons out of their land. Are you afraid to hear the music of the Silver Branch? Are you afraid to hear the singing of Rhiannon's birds that makes men forget? ~Ygerna. His wife Guenhumara is included in this story and she is portrayed in a unique way, a mix of other versions I have read and quite human and very likable. Unfortunately, and although I always know it is coming, my stomach still clenches over the imminent betrayal. The whole feel of the book is noble and romantic in the same way that following a dream is. The way that Sutcliff describes Britain is real, but there is a touch of underlying magic to it. The way that Artos's mother's tribe, the Little People and other legends such as The Lady of the Lake are presented contain kernels of truth that are the foundation of these rich myths. Starstruck Over: The language of this story which put me in the thick of Artos's journey. This really sounds great, Midnyte! I enjoy Arthurian tales, and this reminds me that it's been too long since I last read any books about him. Hmm, wonder if this is on audio? The Next Big YA Book!